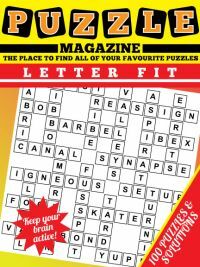 Our binary puzzle magazine has 52 brand new binary puzzles for you to enjoy. 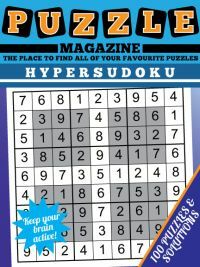 This puzzle is not that commonly seen, so if you've not played it before, well, here's a guide quick to binary puzzle solving strategies and methods. Take a look at the grid to the right. 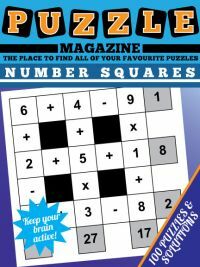 The easiest place to get started is to look for double zeroes or double ones in the grid, and fill around those. We can instantly see that in the first column there is a '0' so we can place 1's either side of the 0's, because we know it is against the rules to have a number appear more than twice in a row. We can use the same method applied to the rows, and we see that in the third row there are two 1's in consecutive cells, again we can then place 0's at either side of those. 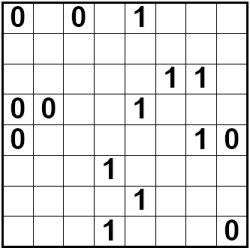 Another simple strategy for solving binary puzzles is to look for this pattern "0 - blank - 0" or "1 - blank - 1". We can fill the middle cell of this pattern with the other number: where we have 0-blank-0 we know the blank must be 1. Can you see why? Because if it weren't so, we would have 000 or 111 which of course is against the rules. So right at the start of the puzzle, in row 1, we can place a '1' in the second cell. Another key rule is to use the information you have just placed to make further deductions about the placement of the 1's and 0's in the grid. So you may find at the start you go around several times applying these two rules, each time there are further deductions that can be made. For instance, since we know that row 3 column 8 must be a 0, we now have created an instance of the '0-blank-'0 pattern in the final column, and therefore can place a '1' at R4C8. Look at column 1. It already has three 0's in it, so we know there is just one more. Let's ask ourselves what the second value in the column is (R2C1). Well, imagine it were a 0. That would mean all other values in the column would be 1, as we would have placed all four zeroes. BUT that would mean the final three cells in the column were ALL 1's, giving us the forbidden combination '111' at the end of the column. This means that R2C1 CAN'T be a 0, and so must be a 1. Finally, each complete row must be unique and each complete column must be unique in a binary puzzle. 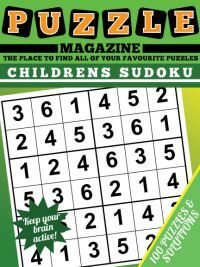 With hard puzzles you might sometimes need to use this fact to work out where a number goes: this simply involves checking each row against each row and the same for columns, though this can be tricky as all those 0's and 1's can confuse your mind so be careful whilst using that rule! That's it for the strategy and solving hints and tips for binary puzzles, we hope you've found them useful. 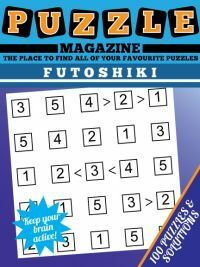 Now why not download the binary puzzle puzzle magazine and enjoy 52 all-new binary puzzles!